Iranian Red Crescent Medical Journal - Can the BASNEF Model Help to Develop Self-Administered Healthy Behavior in Iranian Youth? To Cite: Shahnazi H, Bee Koon P, Abd Talib R, Lubis S H, Ganjali Dashti M, et al. Can the BASNEF Model Help to Develop Self-Administered Healthy Behavior in Iranian Youth?, Iran Red Crescent Med J. 2016 ; 18(3):e23847. doi: 10.5812/ircmj.23847. Background: The stage of youth is critical for human development in several ways. On the one hand, it can lead people towards the adoption of a healthy lifestyle during adulthood based on these earlier practices. On the other hand, it can comprise the development of healthy living practices later on in live, an outcome which is often caused by the youth adopting a risky lifestyle early on. Objectives: The primary objective of this study was to determine the effectiveness of implementing an educational intervention program based on the BASNEF Model (a simplified approach to understanding behavior), designed to cultivate self-administered lifestyle control skills in youths. Materials and Methods: This was a quasi-experimental intervention study, implemented during 2010 - 2011. A total of 288 randomly selected high-school students between the ages of 15 and 17 participated in this study. These students were later divided into experimental and control groups. Subjects completed a BASNEF questionnaire at the baseline (pre-test), one month later (post-test) and three months after the educational intervention (follow-up). Four educational sessions were held, each of a 120 - 150 minute duration. After the data had been collected, the ANOVA test was used to compare trends in changes. The Pearson correlation coefficient was then used to analyze the correlation between components of the BASNEF model. Finally, regression analysis was used to determine the predictive power of the study. Results: Results from the intervention study reveal that the beliefs and attitudes about nutrition of the intervention group, calculated in terms of scores, improved significantly for both male and female subjects (P < 0.001) as compared to the control group. The mean BASNEF scores for improvements in beliefs among girls and boys were 79.2% and 70.1%, respectively and for attitudes, 61.2% and 59.4%. The increase was significantly higher in the intervention group (P < 0.001). Furthermore, participation in physical activity was more frequent among members of the intervention group than among those in the control group (P < 0.001). Conclusions: The BASNEF model could be effective in encouraging the adoption of nutritious eating habits and more active lifestyles at an early age in order to foster long-term health and well-being. Youth is a period of development leading to biological, physiological, mental and social maturation. It is during youth when risky behaviors are often adopted, which could have an adverse effect on an individual's health in adult life. Some researchers have suggested that there is little or no connection between the socio-economic status and health of teenagers, whereas others have argued that there is a strong correlation between these factors (1). It is clear, however, that some social inequalities do cause differences in the way teenagers perceive their own health, as well as whether or not they are overweight or obese; differences here are also determined by gender (2). Young adults clearly have special nutritional needs as a result of rapid growth, and with the onset of puberty, additional physical changes affect the maturation process, and consequently the development of a healthy (or possibly unhealthy) lifestyle (3-5). The term “lifestyle” refers to a unique style of living which reflects the particular value system of a person or group. How one chooses to spend his or her free time is considered to be a part of one’s lifestyle; the existing spare time could be spent in a variety of ways, including watching television, reading books, or even consuming a great deal of food. In contrast with spending spare time on sedentary activities or other activities with perceived negative consequences (such as overeating), some youth may participate in sports, exercise (e.g. yoga or fitness classes), or even take walks simply in order to keep moving. While one young adult may relieve stress or tension in an unhealthy way, such as by eating voraciously, someone else might choose to engage in physical activity, counseling or meditation instead. It should be noted that healthy behavior tends to develop during the teenage years based on the kind of lifestyle that is adopted, and if unhealthy behavior becomes a habit, the delayed adverse effects may emerge in the form of more serious health problems later on in life. For example, unhealthy lifestyle in adolescence have been associated with frequent illness in adulthood (6). Since one of the goals of education can be behavioral change, the understanding of behavior afforded by various behavioral change theories provides insight into the formulation of effective teaching methods for this purpose (7, 8). Educational intervention is a program based on a specific set of predetermined conditions established through the analysis of various models. For instance, the BASNEF (Belief, Attitude, Subjective Norm, and Enabling Factors) model can be used to design health education programs based on an adequate understanding of the relevant community. The effective implementation of this model can lead to changing attitudes about nutritional patterns and physical activity. For instance, educational intervention based on the BASNEF model can possibly help to cultivate lifestyle management strategies that allow individuals to monitor their intake of food and physical exercise (9-11). Therefore, it has been recommended that effective educational intervention about nutrition for youth should have a behavioral focus that will utilize a strong theoretical framework, minimize the targeted risk factors, lead to constructive changes in the environment, provide adequate guidance about the consumption of food, and include strategies that are developmentally and culturally appropriate (8, 10). In general, nutrition education is an important component in health promotion programs, broadly defined as ‘any set of learning experiences designed to facilitate voluntary adoption of eating and other nutrition related behavior conducive to health and well-being’ (11-13). High schools can be an effective medium to influence the health of the youth via the implementation of educational intervention programs that focus on nutrition. This is because the school system provides an opportunity for high levels of contact with the relevant subjects, as well as both formal and informal learning environments that allow for various teaching methods to be easily implemented (14). According to Perez-Rodrigo and Aranceta (15), a comprehensive and sequential school-based nutrition education program should promote the development of appropriate intentions and self-administered behavior as prerequisites for adopting life-long healthy nutrition-related behaviors (15, 16). The high rates of malnutrition in some communities, and the increasing overnutrition in both urban and rural areas in Iran, justify the need to provide educational intervention about health and nutrition for children and youths (15). However, present efforts, such as the School Health Program and the School Milk Program do not promote the development of intentional self-administered behavior that is integral to making permanent health and nutrition-related behavioral changes. It is generally accepted that nutrition education facilitates the prevention and control of excess weight and obesity and their associated consequences (17, 18). Furthermore, youths with higher levels of physical activity have decreased levels of cardiovascular disease risk factors (19) and are more likely to be successful in controlling their weight (20). Due to the considerable increase in excess weight and obesity among adolescents worldwide (21, 22), it has become necessary to urgently develop and put in place effective nutrition education and physical activity programs to control weight before it becomes a life-long problem. The BASNEF model is believed to be one of the best models to use when attempting to resolve educational problems regarding nutritional patterns and regular physical activity (23). The model is a simplified approach to understanding behavior based on the PRECEDE model and the Value Expectancy theory. The primary aim of this study is to determine the effectiveness of educational intervention designed to promote self-administered control of healthy eating habits and regular physical activity in Iranian youths, based on the BASNEF model (24). The ultimate objective of this study is to predict behavior based on an understanding of the intentions of youth after such educational intervention. This study was conducted in three separate phases: I, II and III. Phase I and II consisted of cross-sectional studies, and an interventional study was conducted in Phase III. The target population was boys and girls in Iran, and the study population consisted of boys and girls in Isfahan (Total number in the pool: 12,500). In order to begin framing the sample, a list of schools for girls and schools for boys in each district of Isfahan was reviewed. The sample unit consisted of boys and girls in this school district between the ages of 15 - 17. The schools were selected using the Fisher-Yates random number table. Isfahan is geographically divided into five districts, numbered sequentially according to the Ministry of Education. The number of high-schools selected from each district was proportional to the size of that district. Since schools in Iran are segregated by gender, in each district, proportional random sampling was employed at both types of schools. Simple random sampling was used in each district for Phases I and II, and using these samples, an interventional study was conducted for Phase III. Subjects were selected from four schools at the senior high-school level via the use of the multistage cluster random sampling method. One school from each gender was chosen from which to select the experimental group’s subjects, and another two schools served as the pool from which the control group was selected. Phase III involved the experimental pre-test, post-test and follow-up intervention study, and the participants were randomly selected students divided into two groups (288 students in both the experimental and the control group) (Figure 1). The study was conducted after receiving written permission from the deputy research officer of the Isfahan university of medical sciences and other officials from the department of education. Approval was also required from the school districts with the code number p12/6/3519/9. The study was conducted in the public high-schools of Isfahan in 2010 - 2011. All students had signed the written consent form, and the study was officially approved by the Research Council and Ethical Committee of the Isfahan University of Medical Sciences. The inclusion criteria were as follows: (1) subjects must have had an inclination to be involved in the study; (2) they should not have been on a particular diet or taking any medication; (3) they should not have had any physical disease that was included in the list provided on the demographic questionnaire. The exclusion criteria included a general unwillingness to participate in the research, and absence from the academic sessions. In order to calculate the sample size, the following equation was used, comparing the mean of the two groups. α = type I error, usually 0.05 - 1.96.
β = type II error, usually 0.20 - 0.841.
σ = standard deviation pool. Δ = the smallest difference of interest between the two groups. The sample size was then increased by 4 times to reflect the gender separation N = 72 × 4 = 288, (boys and girls) as well as the studied scenarios (experimental and control group). The nutrition education involved implementing requirements for the student to make self-administered dietary changes both at school and at home. Nutritional concepts were taught to the students using hands-on activities, video presentations, exhibitions, and messages and other displays posted on school bulletin boards. During educational sessions, teaching methods such as group discussion and dialogue sessions were used. Pamphlets, CDs and Slides, designed based on the BASNEF model, were dispensed to the students. Each educational session lasted between 120 - 150 minutes, and the venue was the same conference hall. In terms of educational content, students were taught about the prevalence of increased weight and obesity, the growing morbidity rate from obesity, the importance of self-administered healthy eating habits, the benefits of regular physical activity, the effects of sleep duration, the role of family in helping the students, and some dietary recommendations such as the inclusion of more low glycemic foods. The questionnaire was designed using the Likert scale as the scoring method. Answers were based on a version of the 5-point Likert scale (certainly agree = 5, agree = 4, no idea = 3, disagree = 2, and certainly disagree = 1). The questionnaire was comprised of statements based on the BASNEF model, addressing issues of belief, attitude, subjective norms, enabling factors, and other concerns about healthy eating, physical activity, and the general process of self-administration. The students recorded their eating habits and physical activity in a diary, and returned it to the researcher at baseline, post-test, and follow up phases. To ensure the clarity of the questionnaires, a pilot study was performed using coherence and consistency tests on 30 students who were not included in the survey. The questionnaire was modified based on feedback derived from the students. The validity of the content was established by three experts who were either academic staff or health educators. Finally, the questionnaire was assessed by an expert panel. Finally, the reliability of the questionnaire was determined by Cronbach’s alpha; the questionnaire scored within the acceptable range of 0.78 to 0.85. In Phase III, the educational programs employed in the study were assessed using the BASNEF model. A repeated measures ANOVA test was used to identify any trends in the changes from baseline to post-intervention stages, as well as the final follow-up. A Pearson correlation analysis was employed to determine the correlation between the various components of the BASNEF model. Finally, regression analysis was performed to assess the predictive power of the model. The average values were presented as mean ± standard deviation (SD). The software SPSS (Version 18; SPSS Inc., Chicago IL) was utilized for all of the statistical analyses. The mean age of the 288 students who participated in the study was 16.2 ± 1.1 years, and ranged from 15 to 17 years. Table 1 shows the general characteristics of Isfahani adolescents in terms of the mean and standard deviation of age, weight, height and Body Mass Index BMI. In Phase III of this study, the level of education of the 288 subjects was assessed (224 of normal weight, 38 overweight and 17 obese), as shown in Table 2. In this phase, when analyzed by gender, the majority of males and females were of normal weight (76.6%, 79.1%). However, these numbers also show that a higher prevalence of excess weight and obesity was observed among boys rather than girls. bSignificantly different from boys (P < 0.050). Table 3 illustrates the characteristics of the participants’ parents. College level education was obtained by 30.5% of fathers and 25% of mothers in the experimental group. Going further, 50.7% and 54.2% had diplomas, and 15.3% and 10.4% had attended high-school and guidance school, while 3.5% and 10.4% had attended just primary school. Of the total number of parents considered, 66.7% of the mothers were housewives, 22.2% were government employees and 11.1% worked in the private sector. aData are presented as No. (%) and n = 144. Table 4 shows that scores for all relevant variables of the BASNEF model with regard to healthy eating increased post-test (after one month of educational intervention) and again after three months when compared to the baseline. However, there were no significant changes in the control group in terms of belief, attitude, subjective norms, enabling factors and intentional behavior during this period. Table 5 shows the same pattern pertaining to physical activity. In addition, the results indicate that intention and self-administrated physical activity also increased significantly in the intervention group while there was no significant change in the control group. The intervention was more successful in changing behavior in students with educated parents compared to those whose parents were uneducated. There were no other significant associations among other demographic variables and the constructs of the BASNEF model. The results do, however, indicate the existence of relationships between other components of the BASNEF model. For example, there was a significant positive correlation between attitude and subjective norms (r = 0.48, P < 0.001) and intention for controlling healthy eating (r = 0.42, P < 0.001) (Table 6). This pattern was the same regarding the correlation of subjective norms with intention for controlling healthy eating (r = 0.65, P < 0.001), enabling factors (r = 0.53, P < 0.001) and self-administration (r = 0.62, P < 0.001). There were strong positive correlations among intention, enabling factors (r = 0.78, P < 0.001) and self-administration (r = 0.86, P < 0.001), as well as between enabling factors and self-administration alone (r = 0.82, p < 0.001). However, there was no significant correlation among attitude, enabling factors and self-administration (r = 0.08 and 0.066 respectively, P > 0.05). In the regression model (Table 7), the subjective norms score significantly increased intention for self-administering (B = 0.56, P = 0.001), but attitude scores did not significantly contribute to the model (B = 0.08, P = 0.321). This model explained 61% of the variances in intention for self-administration (R2 = 0.616). Both intention for self-administration (B = 0.57, P = 0.001) and enabling factors (B = 0.49, P = 0.001) significantly contributed to the model estimating self-administered behavior (R2 = 0.688). aDependent Variable: Intention for self-administer. bDependent Variable: Behavior for self- administering behavior. This intervention study aimed at assessing whether or not the BASNEF model could be an accurate predictor of the success of lifestyle self-administering behavior in youth. The results of this study indicate that educational intervention based on the BASNEF model improves students’ self-administration abilities. Clearly, the behavioral intention for healthy eating in the experimental group improved significantly after intervention. This might be due the effect of the intervention program on the students’ subjective norms and enabling factors. Previous studies support the notion that enabling factors could have an impact on attitude changes (25-27). 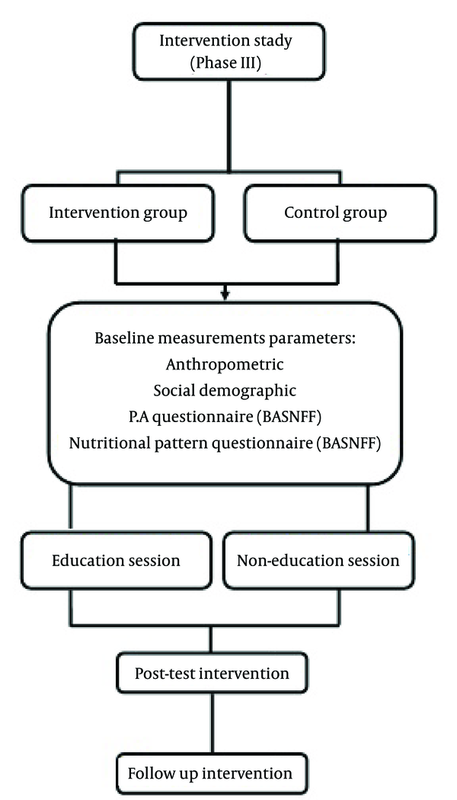 In these studies, the scores of the enabling factors, which were among the main components of the BASNEF educational model, significantly improved after intervention in the experimental group. Some earlier studies in health education measured subjective norms before intervention in order to determine the influence of the target group’s subjective norms on designing educational action without evaluating the level of effectiveness after intervention (27, 28). However, in this study, subjective norms involved physical activity after the intervention, in order to determine the importance of subjects’ behavior in developing healthy eating habits and engaging in regular physical activity. Furthermore, the outcomes from this study are in agreement with several other studies carried out on similar variables (26-31). When looking at the work done by Lee and Bae (26), Rhodes et al. (32) and Downs and Hausenblas (33), a significant correlation was found between self-administered behavior, intentions for healthy eating and regular physical activity, control, and enabling factors. The correlations observed between attitude, intention and subjective norms indicate the effectiveness of the BASNEF model in controlling and preventing increases in weight. Furthermore, the significant correlation between all constructs of the BASNEF model, except for attitude, enabling factors, and self-administration, is also consistent with the findings from other studies (25, 27, 34). As a result, the use of an educational intervention-based model to enhance self-administered healthy eating and regular physical activity has its obvious merits, even though more time is required to assess the comprehensive impacts of the educational intervention on weight increases or decreases over time. As a result, focusing only on immediate changes in healthy eating behavior and regular physical activity might be considered as a limitation. It was observed that the behavioral intention for healthy eating in the experimental group improved significantly after intervention. The changes observed may be attributable to the intervention program according, to the subjects’ subjective norms and enabling factors. Previous studies support the possibility of enabling factors affecting attitude changes (23, 27). In the mentioned studies, the scores of enabling factors, which were among the main components of the BASNEF educational model, improved significantly after intervention in the experimental group. It could be concluded that these factors provide relevant information and lead to self-administered healthy eating. In contrast, in the present study, these factors were not different in the control group, and consequently, the subjects’ attitudes and intentions for healthy eating did not change. The use of enabling factors improved some preventative behaviors in the experimental group, as similarly mentioned in another study (29, 31). In our study, the subjective norms involved physical activity after the intervention to determine the significance of subjects’ behavior in administering healthy eating and regular physical activity. This is one of the most important strengths of this study. However, some health education studies measured subjective norms before intervention to determine the influence of the target group’s subjective norms on designing educational action without evaluating the level of effectiveness after intervention (28-30). There is agreement between the findings of this study and numerous studies conducted on similar factors (26, 32, 33). In accordance with the work of others (Lee and Bae 2001; Symons Downs and Hausenblas 2003; Rhodes et al. 2006), a significant correlation was found between performance behavior and intention for healthy eating and regular physical activity control and enabling factors (25, 31, 35). Some researchers have also highlighted that other educational models such as PERECEDE or health belief models have important roles in increasing the beliefs, attitude and behavior of target groups related to health (36, 37). Furthermore, several other studies have also indicated that applying different models might be more beneficial than relying on the BASNEF model (36, 38). For instance, nutrition education the nutrition education increase the score of knowledge in diabetic patients; however, choosing an appropriate educational model (e.g. health belief model) helped to increase the score of behavior and also changed the metabolic factors that contribute to the development of diabetes (38). Health education intervention is reported to provide an additional 15% - 30% improvement over and above the effects of medication alone for a given medical condition (39). As such, health education develops the individual’s capacity for self-management and saves on health-care costs as a whole (38). A study conducted by Ruzita and Ismail (2007) similarly showed that knowledge about nutrition among school children in Malaysia can be improved by means of nutrition education programs (40). Utilizing the BASNEF model was quite successful and this should be considered when evaluating the implications of the results (41). This study showed that girls had a better attitude and were more successful regarding self-administered healthy eating behavior. The girls had better attitude regarding eating behavior but, the boys had better attitude regarding physical activity. This could possibly be the result of the higher levels of health consciousness in girls, as indicated by Cutler et al. (42). This study is a confirmation of the usefulness of the BASNEF model as a powerful tool for developing educational intervention and self-administering behavior. Therefore, the planning and application of educational programs such as that used in this study on similar and broader scales is recommended. However, to successfully promote a healthy lifestyle in youth that will ensure the effective control of weight, a broad range of factors connected with eating behaviors and physical activity need to be considered. Efforts to promote healthy eating habits and regular physical activities among youth must engage all segments of the society, such as the government as well as non-government agencies, health professionals, the food industry, the media, school authorities and parents. There have been some limitations with the study starting from its inception. For instance, the use of three-day food and physical activity records recorded by the adolescents depended on the honesty and consistent cooperation of the participants. Therefore, further research with both widened and specific scopes on adolescent obesity is recommended. Furthermore, the limitation of time has constrained the duration of assessment, especially during holiday seasons and examination time. Finally, our data suggests that overweight and obese adolescents were at alarmingly high rates in comparison to the global rates as reported by WHO. Therefore, further studies should explore risk factors among adolescents that may determine different dietary patterns and inclinations toward physical inactivity. It would ultimately help to prevent Iranian youths from gaining even more weight. The findings of this study have shown that nutrition education programs based on the BASNEF model can positively influence students’ nutritional and physical behaviors, and this is due to having different structures in place, such as enabling factors. Our hypothesis was confirmed, since the education model of BASNEF has been shown to improve the healthy lifestyles of students. The constructs of the BASNEF model help to improve self-administration among youths, which will help them to continuously maintain healthy weight levels well into adulthood. The authors would like to thank the head of Isfahan high-schools who had full cooperation with us and also extend special thanks to the participating youths. Authors’ Contribution: Study concept and design: Hossein Shahnazi, Nimah Bahreini; acquisition of data: Ruzita Abd Talib; analysis and interpretation of data: Syarif Husin Lubis; drafting of the manuscript: Elham Khatooni, Nimah Bahreini; critical revision of the manuscript for important intellectual content: Poh Bee Koon; statistical analysis: Syarif Husin Lubis; administrative, technical, and material support: Poh Bee Koon; study supervision: Poh Bee Koon. Funding/Support: This study was supported by grant from deputy of research of Isfahan medical university.